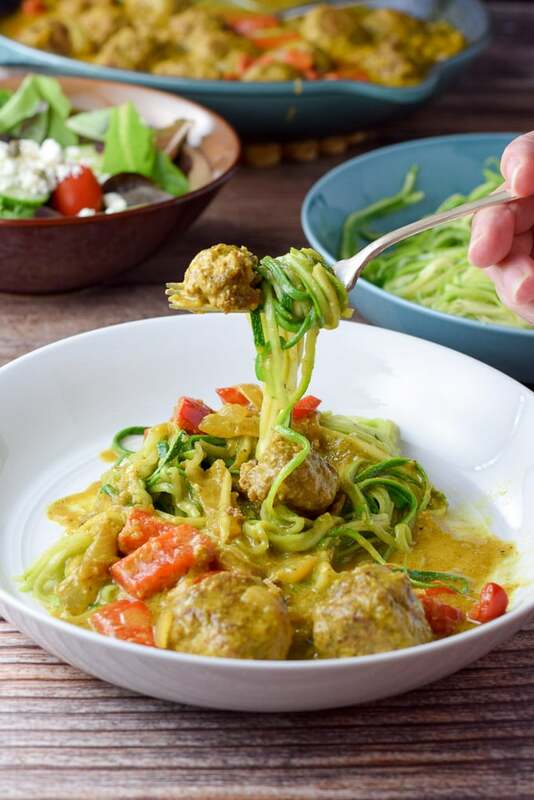 Nothing beats a good curry meatballs on zoodles recipe! This one is a winner. So, make it and see! Zoodles are fun. Not only are they fun to eat, but they are fun to say. For example, try saying zoodles multiple times in a row. See? Fun. Do you have a spiralizer? I don’t because I have this gadget. By the way, since Christopher and I have zoodles more often now, I’m thinking I should get one because even though I love the gadget, it’s getting old, quickly. So, do you have a spiralizer that you love? Let me know the brand in the comment section so I can check it out!! Do you have a go-to meal when you’re feeling bored of the usual food fare that passes your table? This is my go-to meal. I love meatballs so much that I believe I would eat just about anything over them. However, there are limits. I wouldn’t have cream corned poured on them, nor would I nestle some hotdogs along side these round lovelies. But laying some meatballs on zoodles and then smothering them with some curry sauce? Now that’s the curry meatballs recipe I would call perfect! 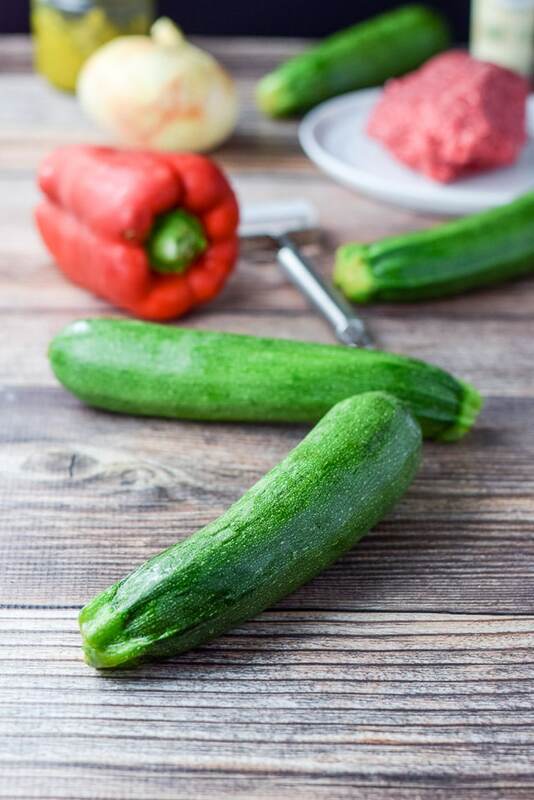 We have three zucchinis, a red pepper, onion, grass-fed beef, curry paste and certainly that julienne peeler gadget I talked about. I peel the zucchini. It takes me about 10 minutes to get the zucchini cut into zoodles. Finally, I set them aside on a paper towel. Next, I start the curry sauce. I set my wok on the stove and heat it to medium. While it heats up, I chop the onion and red pepper. 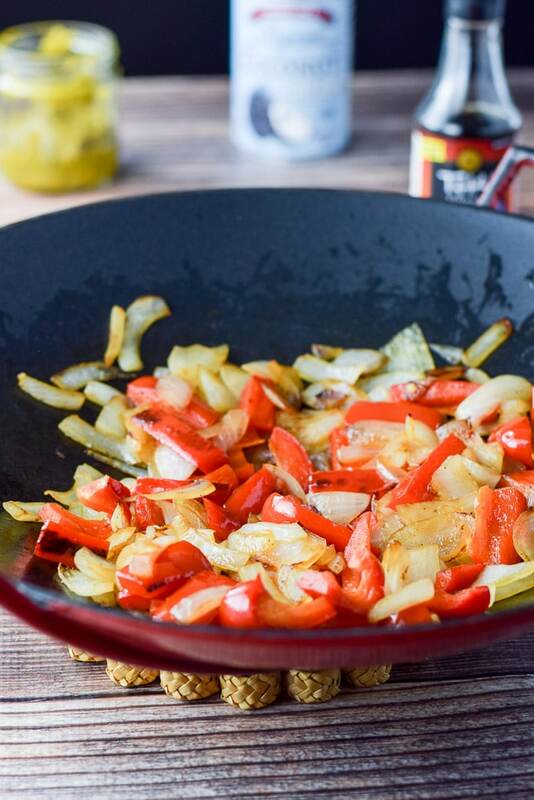 Also, I toss a few tablespoons of olive oil into the wok and drop in the veggies. As the veggies sauté, I start on the meatballs by placing the ground beef in my medium stainless steel mixing bowl and add an egg, salt, pepper, cumin, curry and almond flour. I set the heat under my sauté pan to medium. At last I gear myself up to get my hands dirty. Furthermore, I dig in and massage the crap out of the meat. Then I roll the meatballs into medium sized balls and set them aside. As a result, the veggies are done by now. My sauté pan is also ready. I add olive oil and the meatballs. I stand there and flip them every 2 minutes hence the meatballs take around 8 minutes. Also, I let them be a little underdone because I am going to cook them in the curry sauce. Also, it’s time to deal with the curry. So, in my wok, I add 1/2 cup curry paste (that I made from Pinch of Yum’s recipe), 1 can of coconut cream, fish sauce, garlic paste and ginger paste. Furthermore, I bring the curry sauce to a boil and lower it to a simmer. Finally, I add the meatballs and let them simmer for 5 minutes. During that 5 minutes, I put the zoodles in the sauté pan that had the meatballs in it and let them cook on medium/low. When the timer dings, it’s finally time to eat. I scoop some zoodles on my plate and also spoon some meatballs and curry sauce on top. 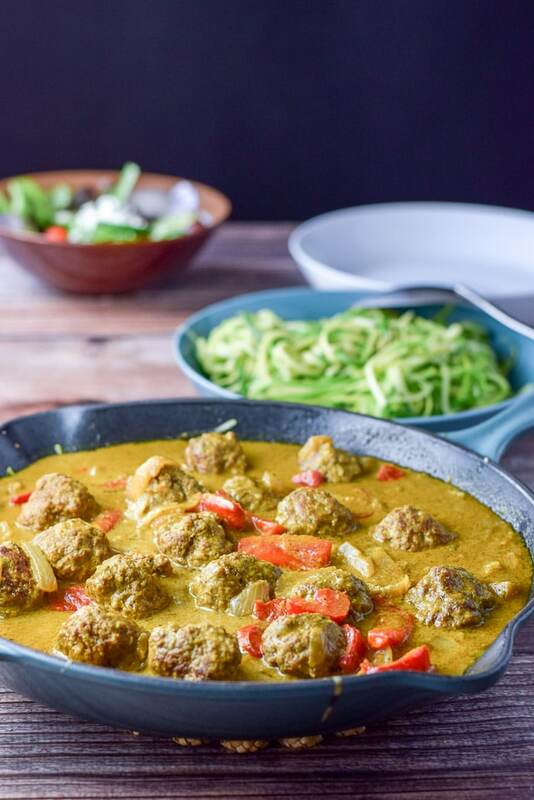 So, I hope you enjoyed this Curry Meatballs on Zoodles recipe. Christopher raved about it. RAVED, I tell you. It is so good! What is your favorite curry recipe? I’d love to know! 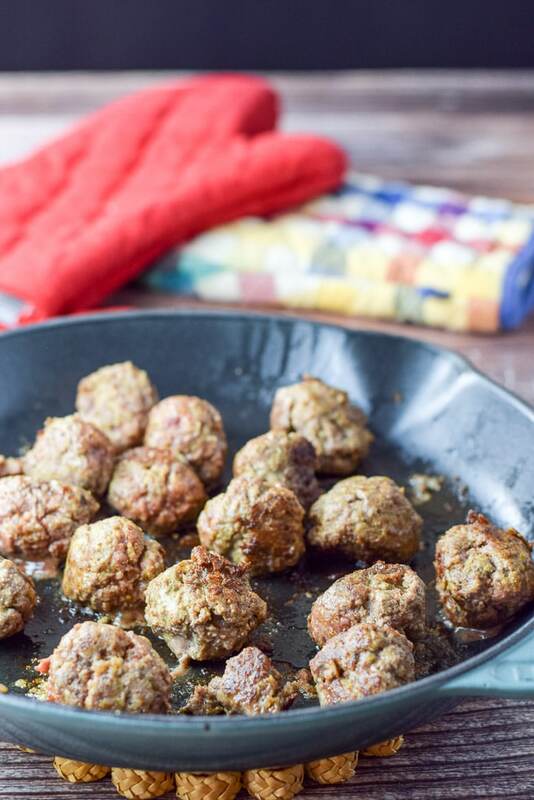 If you’ve tried this curry meatballs or any other recipe on the blog, I’d love the hear what you thought about it in the comments below. I love hearing from you! You can also FOLLOW ME on FACEBOOK, TWITTER, INSTAGRAM and PINTEREST to see more of my delicious food and delightful cocktails! Curry and meatballs together? Delish! And add zoodles? Beyond good! You can cook the curry and meatballs at the same time to shave minutes off your time. Then you can cook the meatballs in the curry at the same time as the zoodles. I am a huge fan of zoodles. This is the perfect recipe for me! Looks delicious! We do love curry here. YES….zoodles are so much fun to make too. Love using my spiralizer. This would be a great dinner any night of the week. So full of flavour and perfect for carb watchers too. I am all about curry and zoodles. I think I’ll try to vegify these meatballs. Because this looks soooooooo good! Thanks Jeni! I love vegifying meals too! I bet any meatball would be great with this! Or Tofu! I love all the fresh flavors in this dish! This might be just the recipe to convince my husband to try zoodles. I just love a spicy curry dish and the flavors in this sound incredible! I am pinning for later. Thanks for sharing! I’m always looking for new zoodle recipes, and this one is perfect!! Something way different than my usual red sauce and chicken. Love this! Thanks Karly!! It’s really delicious! God, I totally need these right now! They look so good and I’m hungry! I love that you use fish sauce in the curry. I haven’t done that before. I’ll have to give that a try! Thanks Beth. It’s super duper yummy. The fish sauce gives it a little extra flavor! 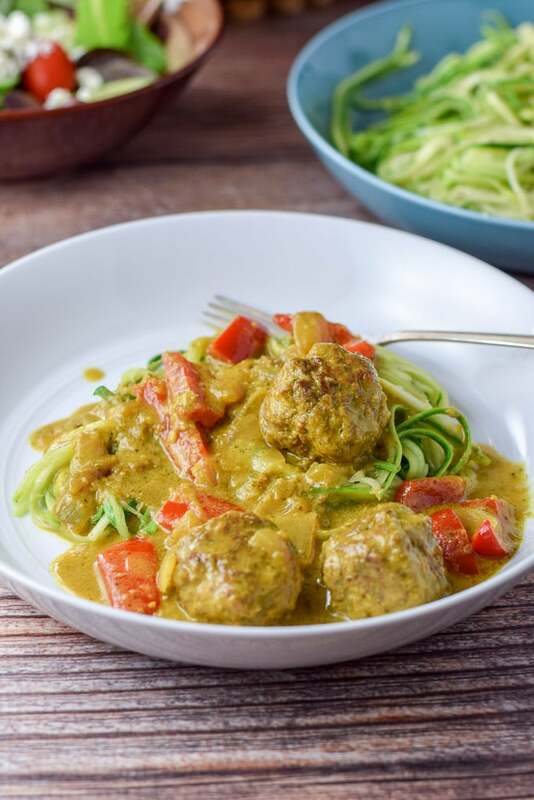 I love curried meatballs and it’s such a fantastic idea to serve them with zoodles! I really should get my spiralizer out more often. I can’t wait to get a spiralizer out since I do it by hand. Yikes! Thanks for commenting Corina! Yes. I did rave about them. I’m still raving about them. This dish was exceptional. We love curry and this looks awesome! I wonder if I could get my son to eat zoodles…..
Cheryl, put lots of curry sauce on it so he doesn’t see any green. 😉 Thanks so much for commenting! That is a yummy and pretty dish you can’t get bored of! That creamy curry sauce is to die for! Thank you Nicoletta! It’s a favorite in my house! These look SO good! Love that you paired the zoodles with curry – I don’t think I’ve seen that before! We love our zoodles!! We started with a little gadget and then graduated to a spiralizer. The gadget is now in our travel box so we have a zoodler wherever we go. 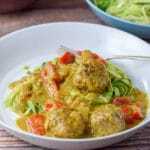 I love the idea of meatballs on the zoodles and then you made it into a curry. Very clever. What kind of Spiralizer do you have Marisa, I’d love to know. I want to buy one! I just had curry meatballs at a new local restaurant the other night. Yummy! I like that you added them to zoodles – nice combo! The curry meatball sauce absolutely would get along perfectly with that zoodle… love the idea. Thanks Çitra! I appreciate it and agree!